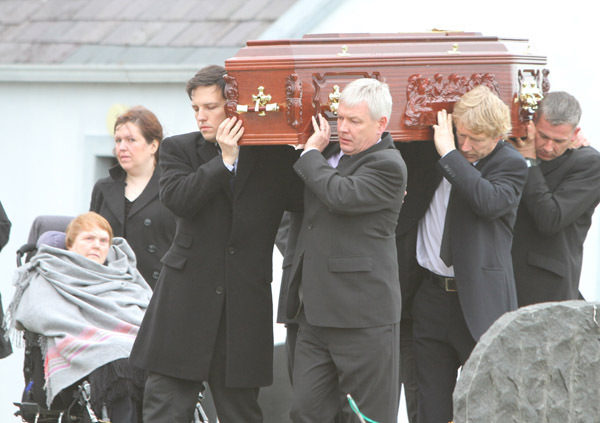 Tom Gilmartin was laid to rest at St. Michael’s cemetery below the Urris Hills on Tuesday morning, his Inishowen wife Vera chief among the mourners by his graveside. Father-of-four Mr. Gilmartin (78), whose evidence of planning corruption at the Mahon Tribunal brought down Taoiseach Bertie Ahern, died in Cork last Friday but was buried here, close to the home place of loving wife Vera Kerr, from Letter, Clonmany. Mourners at the funeral, presided over by Clonmany Parish Priest Fr. Fintan Diggin, burst into spontaneous applause when son Tom Jnr. said that his dad had ‘deserved better’.